The current, severe epidemic of Lassa Fever in Nigeria has killed around 100 individuals. Although over 1,500 patients were suspected of having the illness, the diagnosis has now been confirmed in 400 patients – making the fatality rate almost 25%. Of the 4,200 individuals who are contacts of these patients (and are therefore at-risk of the disease), most have now been shown to be free of the infection – leaving around 660 that are still being followed-up. 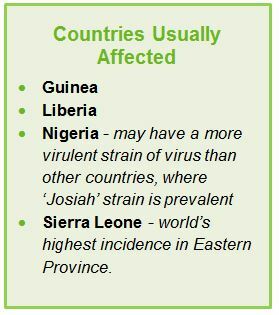 Named after the town in north-east Nigeria where the first three cases of this viral disease were first identified, Lassa Fever can produce a devastating infection which results in 5,000 deaths each year. Up to 500,000 individuals are thought to become annually infected, mostly in Western and Central Africa, by coming into contact with a mouse called Mastomys Natalensis, common in rural areas. 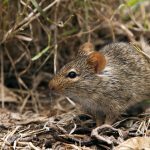 Up to 30% of the Mastomys rodents may become infected with the Lassa virus. The mice are relatively unaffected by the virus, but for the following 100 days the infection can be spread to humans, causing serious disease. After entering a rural dwelling, the infected mouse’s faeces and urine can contaminate human food sources, unwittingly be rubbed into broken skin, or even be inhaled. Transmission is also aided by the occasional local practice of eating rodent-meat. Human to human spread can then occur by close contact with an infected person’s bodily fluids – catching the virus by inhalation is thought not to be possible with human transmission, however. As borne out by the first three cases of infection on record, which were all missionary nurses, healthcare workers who have close professional contact with patients are at particularly high risk of infection. Once infected, only 20% of people will develop serious symptoms; the majority will either not realise that they are infected or will have a mild flu-like illness. Lassa Fever can be a serious condition for the few, however. Following an incubation period of around 10 days, fever and headache can be accompanied by muscle and joint pain. Approximately a third of these patients will develop chest pain, facial swelling and bleeding – often from the gut. Disease progression often occurs by day six of the start of symptoms, when difficulty with breathing can occur (as fluid builds up in the lungs) and seizures start (following the commencement of inflammation of the brain). Death can follow as the virus infects many systems. Having gained access to the body through the gut, skin or lungs, the virus first infects certain white cells which then disperse to various sites in the body through the blood. Following most viral infections, the immune system in the body is usually activated, leading to the destruction of the viruses. Although the research is still at an early stage, Lassa appears to stop an immune response from forming, allowing unbridled viral growth to occur, and overcoming many organs – particularly the liver. There is some evidence to suggest that symptoms may be more severe in travellers and expatriate workers. Whether this is from genetic differences with our immune systems or that the local population acquire a partial immunity to Lassa by repeated infections, is unknown. Diagnosis is confirmed with blood tests which either look for antibodies, which the body makes to the virus, or for the presence of the virus itself, by the use of a genetic technique called PCR. These specialised tests are frequently not available where the patient is located: the blood samples often having to be sent to laboratories out of the country. The situation is further complicated because such samples can be very infectious to the laboratory workers, who require special equipment to protect themselves from acquiring the illness. The use of the anti-viral medication, Ribavirin, within the first 6 days of symptoms, has been a recent advance with the treatment of Lassa Fever. With its use, the mortality rate for severe Lassa infection can now be reduced by up to 10 times. Other therapeutic measures are supportive, meaning that they are not specific for Lassa Fever but can be important for all critically ill patients; they include intravenous fluids, medications to support the function of the heart, and interventions such as ventilation. Special measures must also be taken to protect the healthcare workers from infection. Such interventions are usually given in intensive care settings, but such facilities are available in few locations globally, however. There is as yet no vaccine for Lassa Fever. As the early symptoms of Lassa Fever are common to many illnesses, including more serious infections such as Ebola, diagnosis at this stage can be problematic. Given the overwhelming incidence of other diseases, such as Malaria, in sub-Saharan Africa, if an individual is unwell with a fever, headache and muscle pain, Malaria is far more likely to be the cause than Lassa Fever. The importance of taking anti-malarial medication, to avoid diagnostic confusion is particularly important when quarantining procedures are being practised. Despite Lassa Fever being endemic in West Africa for many years, the number of ‘imported’ cases that have spread to other countries by airplane is few. Extensive contact tracing has been performed which has found only one person, who was without symptoms, infected in this way. Commercial air travel produces a very low risk of transmitting Lassa Fever. Make the house unattractive to rodents by cleaning the dwelling frequently. Avoid the bodily fluids of feverish individuals. Lassa patients are infectious for three months after recovery.